I glanced across Maximal Music (Arte Nova, 1997) at the public library and got curious. It’s always nice to see some curveballs included with the usual Bach, Mozart, Miles, and Duke that make up the classical and jazz sections. 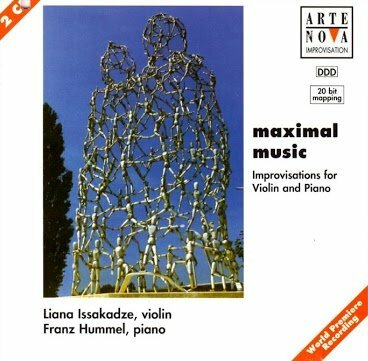 The disc is subtitled “Improvisations for Violin and Piano,” and true to form, it consists of 14 purely improvised pieces, ranging from romantic to spiky and avant-garde, relatively speaking. Liana Issakadze doesn’t go nuts with extended technique on the violin, but she does get playful with bowing tricks and pizzicato flurries. Franz Hummell dives into prepared piano quite a bit. I have to believe both players have been exposed to European improvised music — the likes of Evan Parker, Han Bennik, and so on. The liner notes are written for a normal classical audience, though, and it’s very interesting to see improvisation, which I take for granted, explained in such detail. 66 Shades is a rather melodic album, and some tracks could be mistaken for composed pieces. But the liners explain the carefully unplanned nature of the sessions, the music “carved like sculpture from the air.” That’s a phrase I’ve relished ever since, and I’ve probably misappropriated it once or twice for this blog. Maximal Music could likewise be mistaken for composed music, I suppose, but given the variety and the lack of obvious repetition that’s common even in modern classical music, that “composed” feel still amounts to a nicely bumpy journey. Most tracks stick to a single mood, so there aren’t many surprises in that regard; contrast with European free jazz, which covers a lot of different shades and hues in the span of just a few minutes. That kind of free improv can be like a dandelion seed buffeted by the winds, which is one of the things that’s wonderful about it. Maximal Music seemed to be more about settling upon a structure, then filling in the colors. They do let the playing get adventurous, including some skewed techniques on violin by Issakadze: different bow angles, rubbery koto sounds on “Seventeen” (one of the further-out-there tracks). Some playful call-and-response crops up here and there; the track “Twenty-One” is particularly fun. My curiosity about the album came from the idea that a classical label would take a chance on improvisation, but apparently, Arte Nova was no stranger to the genre. The front cover clearly tags this CD as an “Arte Nova Improvisation” series, as opposed to the normal “Arte Nova Classical.” A cursory check finds at least one other CD, mentioned here; I’ll have to scan the Arte Nova catalog at Allegro to see what else there might be. It’s the joyous clatter you’d expect from Weasel Walter and the sound-based, extended-technique improvising you’d expect from Damon Smith. And while I’m not familiar with Sandy Ewen, it seems she fits right into the aesthetic. Ewen is part of the experimental music/art scene in Houston, which has been bassist Damon Smith’s habitat for a couple of years now. Her instrument is prepared guitar — that is, horizontally placed guitar played with a variety of objects: metal, chalk, kitchen utensils. Keith Rowe is a good point of comparison. What results is an abstract sculpture of non-musical sounds: a thick electronic crunch, like the sound of something big and heavy being pushed forward a little bit at a time, or the springy, metallic sound of impact-on-strings. Variations of these themes build up a collage of activity that could become just a wall of noise. But the trio knows how to hold back and let the music develop thoughtfully. Track 8 (they’re all untitled) is certainly the loudest, with blasts of guitar and vicious drum fills, but it’s also filled with pauses, chances to absorb the events. Track 2 is a slower-moving beast. It sounds like Smith is pressing the bow hard against the strings, creating a slow-motion roar that becomes the “rhythm.” It’s only at the end that the piece begins to fracture into a noisier, chaotic form. Smith couples Ewen’s sound with electronically enhanced bass, sometimes coming across rather crunchy and fuzzy himself. (He contributes some laptop noise as well.) In tiny spots, it’s easy to mistake the bass for Ewen’s guitar — you have to listen for the difference between Smith’s bowing and Ewen’s dropping/scraping sounds. Combined, they create a spiky forest. The opening of the 17-minute track 6, with Ewen making rubbery, sing-songy guitar noises and Weasel doing a woodpecker-on-speed act, really feels like a walk through some alien jungle. Weasel Walter’s pinpoint drumming runs throughout the album. Sometimes it’s boisterous and ecstatic, but more often, it’s a rapid patter, sometimes quiet — an electric coil adding charge to the space. It’s an album of well orchestrated improv and an interesting study in guitar noise. For more about Ewen, you can read this piece from Free Press Houston. It’s called Sun of Goldfinger, and it’s actually David Torn‘s band, not Tim Berne‘s. They apparently played in Denver on Sept. 15. It’s a trio of Torn, Berne, and drummer Ches Smith. That’s 50% of Torn’s band, Prezens, plus 50% of Berne’s band, Snakeoil. As Torn explains in Westword Music, it’s like Prezens without the keyboard, with the guitar as the lone chordal instrument (to the extent that you can discern chords in the sound). The result is a lot like Prezens. Torn blasts his new-age-gone-evil guitar sounds: aluminum soundwalls and squeals, sci-fi sonic blasts. Berne careens and screeches in a way that blends into the mix — although he does take a jazzy turn occasionally; see around the 15:00 mark in the video below, after which they even get into a near-Calypso groove. Smith’s drumming is the element that keeps the whole assembly tied to earth, grounding it in aggressive fills and improvising. Not-quite-related: I’ve been remiss in not mentioning the massive Tim Berne Q&A published by The Village Voice. It’s part of a series of Q&As that’s been fantastic; I especially liked the Ches Smith edition. Aaron Bennett has revived his improvising, mid-sized ensemble, the Electro-Magnetic Trans-Personal Orchestra, as I’d mentioned previously. The group is set to perform this Thursday, Sept. 13 at Meridian Gallery (535 Powell St., San Francisco). When you check out the group’s 2002 album on Bandcamp, you’ll hear what’s clearly an improvising ensemble, but one that operates within an overall structure. I’ve been curious about how the EMTPO operates, and about the fact that Bennett has revived the concept several years after its most recent performance. So I e-mailed Aaron a few questions, which he’s graciously answered. The exchange is below. All italics are added by me, to emphasize the parts that are that cool. Q: Does the group improvise on their own, or are they working from a framework you provide? What kind of framework? AB: “The group uses a framework I devised and provide to the musicians. It is a framework where in each section, the musician is given one of four types of instruction. Which are as follows: 1. A specific rhythmic phrase (leaving the musician to come up with the pitch material), 2. specific pitches (leaving the musician to improvise the rhythmic element), 3. a symbol indicating to freely improvise, and 4. traditional notation. “Each section (or measure) typically has most of the musicians improvising one aspect of the music (rhythm or melody), while a smaller group is freely improvising. The musicians who are not freely improvising are repeating a set of musical phrases. “This enables me have an improvising ensemble where I can encourage a form of continuity within the piece and at the same time utilize the improvisation skills of the musician (and I have been lucky enough to have a great set of improvisers in the ensemble). For example, I may have the same rhythmic phrase passed between sets of musicians in different parts of the composition, as each musician is improvising at least one element of the material, in this case, the melody, there is both continuity and change each time the phrase is heard in the piece. “Also, it was my intention to have the music have an element of stasis within a section along with a few elements of action. The idea was to mimic the “physical world” in a way. Q: What made you decide to bring the idea back? What’s changed about the concept since 2000? AB: “What first made me decide to bring it back was a gig at CNMAT, where I was given carte blanche to do what I wished, and I thought that would be a perfect setting for having a group do these types of compositions. I ended up with an instrumentation that was roughly half brass/woodwinds and half strings. I really enjoyed the mix of timbres that brought out. Nothing has changed about the concept beyond that. Q: Any other shows planned? For the record, I did give this a listen before going to New York and meeting Jeff Arnal in person. But I hadn’t taken the time to write it up yet. 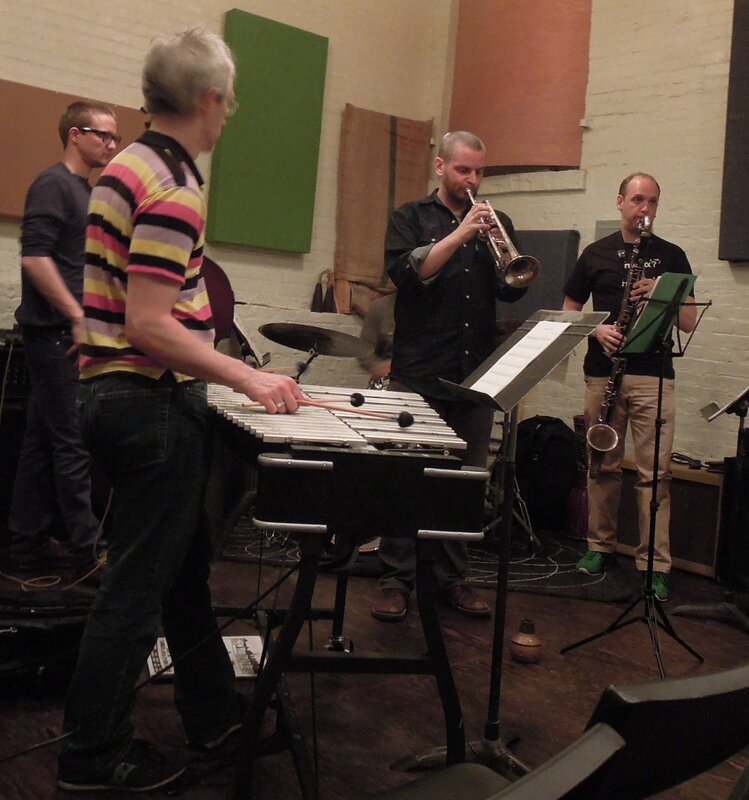 Pail Bug, an improvising quartet, is another collaboration between drummer Arnal and pianist Dietrich Eichmann. The first was in 2004, a Leo Records CD called The Temperature Dropped Again. That was followed by a vinyl 12″ record called Live in Hamburg, recorded in 2004 and released in 2007 as a 12″ LP on the Broken Research label. The cover of Live in Hamburg shows what appears to be some kind of big structure being built, and that influenced my listening. It’s always unfair to ascribe a visual image to a type of music, because so much depends on what’s on your mind in the first place. It’s arbitrary, like having a dream about something you did just the other day. Still — I listened to the spacious, sometimes raucous piano and drums, and I came up with images of grand architecture, of towering structures in progress. The group Pail Bug adds two bassists — John Hughes and Astrid Weins, contributing lots of aggressive arco and extended technique to the sounds of the piano and drums. It’s a busier, buzzier construction site, with the basses babbling and tapping, sometimes filling the percussive role while Arnal scrapes sticks against cymbals to form long tones. Eichmann dabbles in prepared piano as well. “Second Pail” grabs you from the start, pushing directly into a gallop. It’s an engaging and busy opening, and after about four minutes, it decelerates, with buzzing, metallic bass bowing giving the image of a large beast careening to a halt. The quiet segment that follows still has a sense of motion; you’re still moving at a trot. 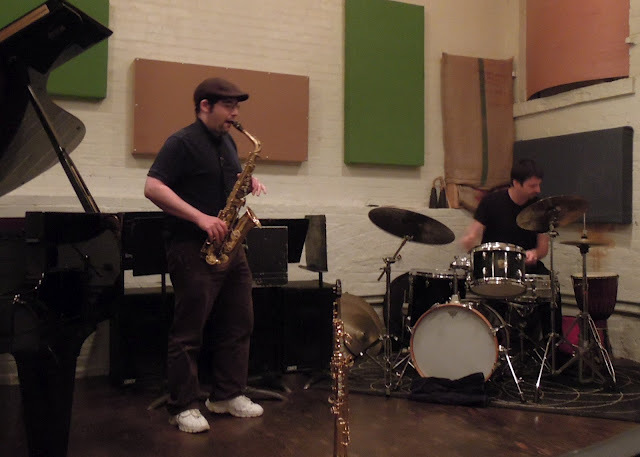 A fast trio emerges later, with Arnal and one bass flying off the handle while another bass chugs along, its bowing providing the rhythm section. I really like the sound of pizzicato bass, and that’s what opens “Third Pail,” accompanied by some kind of industrial-steam sound — I assume it’s coming from Arnal, but I can’t tell, and that ambiguity is a constant theme of Pail Bug’s. The second bass adds some metallic scraping of the strings to complete the bustling, compact trio. Eichmann enters in a flurry, with an angular sort of boogie-woogie prancing, dire and bright, prompting Arnal into a more conventional drum-kit attack. All told, it’s a dynamic 12 minutes. There are five tracks, and you’ve probably figured out the naming scheme by now. “First Pail” opens the album with a quiet aesthetic, with small sounds creeping into the frame, starting as isolated chords or squeaks and building slowly into stirrings. The piece eventually builds into a howl built of bass strings and screeching, scraped cymbals. “Fifth Pail” gives us a good dose of unabashed clatter, including plenty of Arnal’s drum kit. “Fourth Pail” is along the same lines, with (if this makes any sense) a more tempered sound yet a more anarchic feel — except for one moment where the band suddenly hits a dead stop. It might have been cued visually, but on disc, it’s an interesting little surprise. Raskin and Harryman appear Weds., July 18, at the Outsound New Music Summit, and they’ve got a KFJC appearance Sunday night, July 15. Details below. 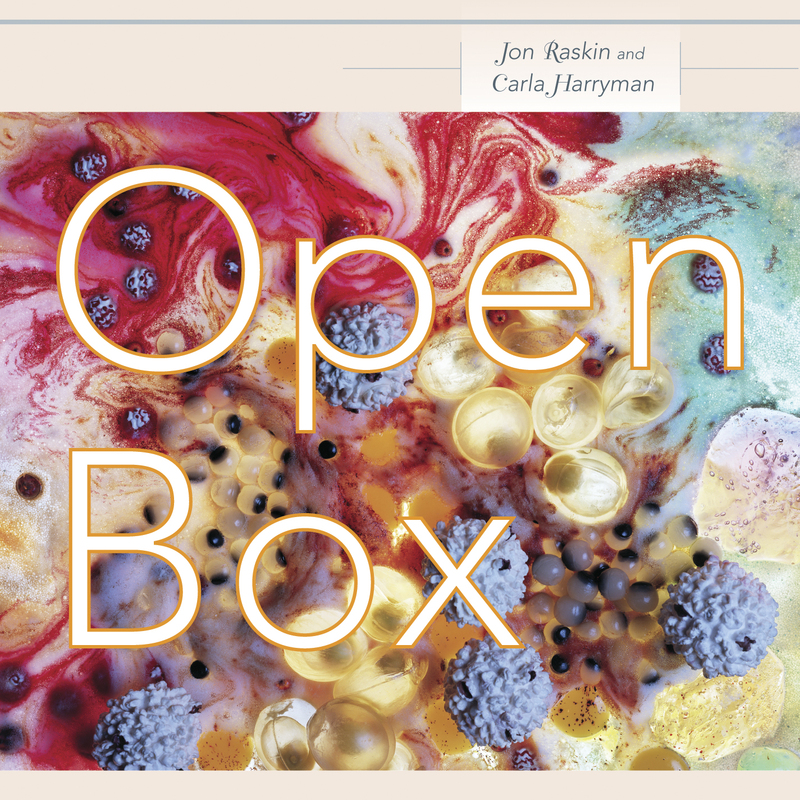 For Open Box, Jon Raskin wrote music to frame the poems of Carla Harryman. It sounds artsy and serious, but the album starts with a sucker punch: the searing metal of electric guitars. That track, “Fish Speech,” isn’t typical of the rest of the album, but it serves to upend your expectations, setting you up for a variety of music and moods. You’d expect Raskin, the “R” in the ROVA Saxophone Quartet, to back Harryman’s abstract word collages with equally abstract music, maybe something improvised or driven by a graphical score. And you’d be right — but he applies other ideas as well, putting to work different combinations of Bay Area and former Bay Area musicians in a total project that took three years to complete. “Fish Speech” dangles sharp-edged guitar and bass over bleak verbal images of the nothingness before time. The words alternate between power and whimsy. (“There were no stories or bones … no lizards, pelicans, or fish.”) But the music sticks to the “power” side, conjuring an empty, chthonic universe — a “nothingness” that’s writhing and explosive, like the near-infinite heat in the microseconds following the Big Bang. 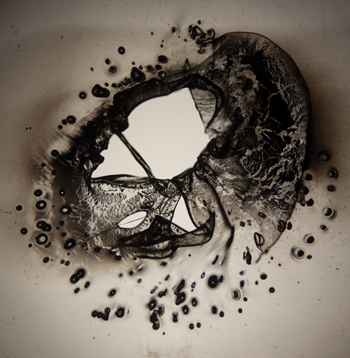 But the album spends longer stretches on improvised music — a suitable backing to the work of Carla Harryman, a teacher at Eastern Michigan University and Bard College whose work is categorized with avant-garde language poetry. Harryman’s work is indirect, as you’d expect. We’ve all been exposed to that kind of poetry, but in listening to Open Box, I tried to pay particular attention to the words. Sometimes, I tried immersing myself in the language, the specific syntax; other times, I could let the words flow through my ears, like a kind of music, a language not intended for directly semantic interpretation. It’s during the closing minutes of Part 2 that Raskin and Harryman diverge, reaching completely separate parts simultaneously. Even with their voices reading calmly, the tension wells up quickly as their non-thematic lines shove one another out of the way. I found my ears hearing one, then the other, as if the words were two colors of ribbon spiraling in front of me. It’s a good effect, creating a coda without having to superficially punch up the music. The music follows a similar path, free improvisation in small motions, like construction activity going on in the background: sparse, rattly sounds from percussion, guitar, and electronics, and the occasional sweetness of Raskin’s sax or, in Part 2, the crinkle of Liz Allbee’s trumpet. I find myself being drawn back to “A Sun and Five Decompositions,” which somehow feels like more of a narrative flow, maybe because of the balletic and criss-crossing among the three speakers (Josephson, Sheikhani, and Harryman) and the music’s interplay with the words. Blips of sax, guitar, and percussion build and release tension in time with the moods of the intertwined spoken parts — three speakers calling-and-responding, sometimes repeating one another’s phrases or meeting in unison briefly. You get the sense of the voices having been orchestrated, a foreground scored to sit with the musical improvising. It’s serious, and yet … there’s a passage where “Don’t be silly!” appears right after someone says “potato head.” Josephson does a particularly good job changing voices throughout the piece, ranging from poetic seriousness to flighty dingbat. But I’d started off talking about variety: “JS Active Meme” closes the album with blistering guitars, a psychedelic sunburst. “Song for Asa” is an actual song, crooned by Aurora Josephson against long tones of sax, then it turns into a quietly bubbling improvisation, with small, popping vocalizations and crackling electronics sounds. The singing, coming up in the middle of the album is an odd sensation after an half our or so of spoken word. Raskin and Harryman, will be participating in the “Sonic Poetry” night of the annual Outsound New Music Summit, on Weds., July 18 in San Francisco. Their set will include Gino Robair on piano. And Harryman and Raskin will also be on KFJC-FM on Sunday, July 15, sometime between 8:00 p.m and 10:00 p.m., to discuss their collaboration. Details on Facebook. Seeing Cecil Taylor was great fun on my New York trip in May, but I was also glad to finally meet Jeff Arnal. He’s a formerly Brooklyn-based drummer who relocated to Philadelphia sometime in the last couple of weeks to start a new job. I’d gotten acquainted with him through KZSU, which has been on the correspondance list for his Generate Records label. He’s put out some good stuff, and I’ve been glad to play it. Arnal also played in an improvising quartet called Transit, which has two albums on Clean Feed. Good stuff. So, I finally got to see him in person and chat for a bit. We talked a little about college radio, and about his pending move to Philadelphia (he’s working with a Pew Center program there). It was good. There are a few people whose names and music became familiar, in a good way, during my KZSU jazz-director tenure, and it’s nice to have finally met a couple of them, even if only briefly. The occasion was a show at IBeam in Brooklyn. Arnal and longtime piano partner Gordon Beeferman played in a trio improv setting with Evan Rapport on sax, and trumpeter Nate Wooley took up the second set with his quintet, playing new tunes. Arnal and Beeferman have played together for more than a decade, I think, and it shows. Their set with Rapport consisted of a few long improvisations, with Arnal and Beeferman showing great intuition for pushing the flow of the music, more than once picking a stopping point or transition point simultaneously. Beeferman’s piano playing was a joy to watch, with his spidery fingers applying an invisibly light touch to produce runs and chords. Rapport put up some good, aggressive sax, often favoring long wails and squeals. As for Arnal, his drumming is wonderful when it’s aggressive and loud, but what really caught my ear in this particular session were the quieter moments, the airy breaks showing off moments of delicacy and a sensitivity to the way sounds can communicate. The Nate Wooley Quintet followed, furthering the bebop tradition with adventurous composing and some terrific soloing. Matt Moran on vibraphone was an unmissable voice in the band, but the whole ensemble was great, from solos to group passages. The new songs seemed to be inspired mostly from Wooley’s time in California, and they were all pleasant jazz tunes with some off-kilter touches in the writing. This stuff wouldn’t be out of place in a jazz club, although the music’s departures from tradition and free-soloing tendencies might distract some audiences. After my trip, I went and bought their first album , (Put Your) Hands Together, on eMusic and I’ll be in line to get the second, I’m sure. 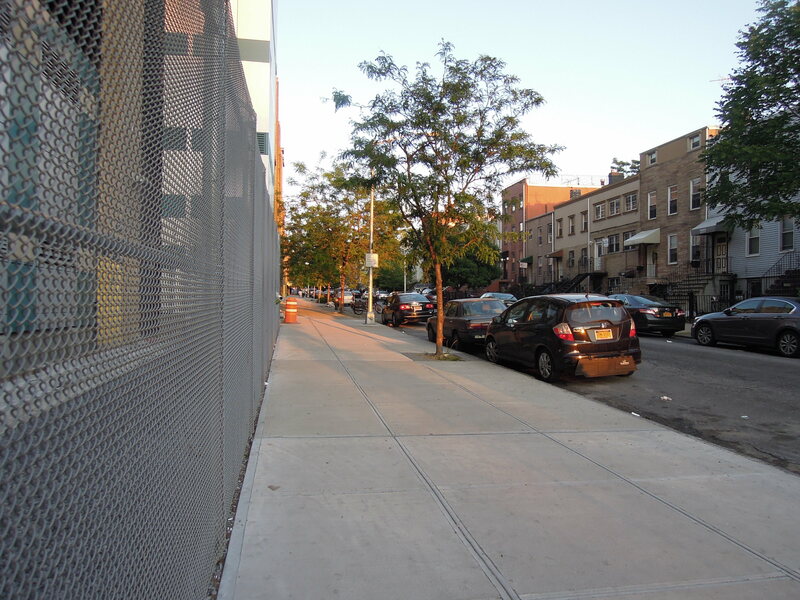 The photo below is a random shot of the neighborhood around iBeam, right around sunset. I think it captures the quiet of the area.